My hair can at times be quite tricky to maintain and keep in good condition. Over the years I have been through too many box dyes than I care to remember and even had my mane bleached to a very unflattering blonde. That was a dreadful phase! I resembled Lady Gaga, not that it's a bad thing. It just didn't suit me in the slightest looking back on it. As of a few months ago I took my first trip to the hairdressers since I was a child. Now that's a big step for me, seriously. I have blonde balayage now, and although it looks beautiful, my hair isn't in the same condition as it used to be. A comb through my hair would result in an awful lot of tugging and pulling at some dreadful knots in my hair. You have to bare in mind my hair isn't the thickest so it was slightly painful. It can also get quite frizzy too when drying naturally which isn't a pretty look. I just feel like there's a million and one things wrong with my hair, haha. All a girl wants in life is good hair. Why wasn't I blessed with it?!Ugh. Anyway without rambling on at you about my fabulous hair(not! ), I wanted to introduce you to a haircare brand called Natural World. It's an entirely new brand to me but they are an organic brand that include 95% natural ingredients and are also free from parabens, phosphates, phtalates, dyes and even gluten. 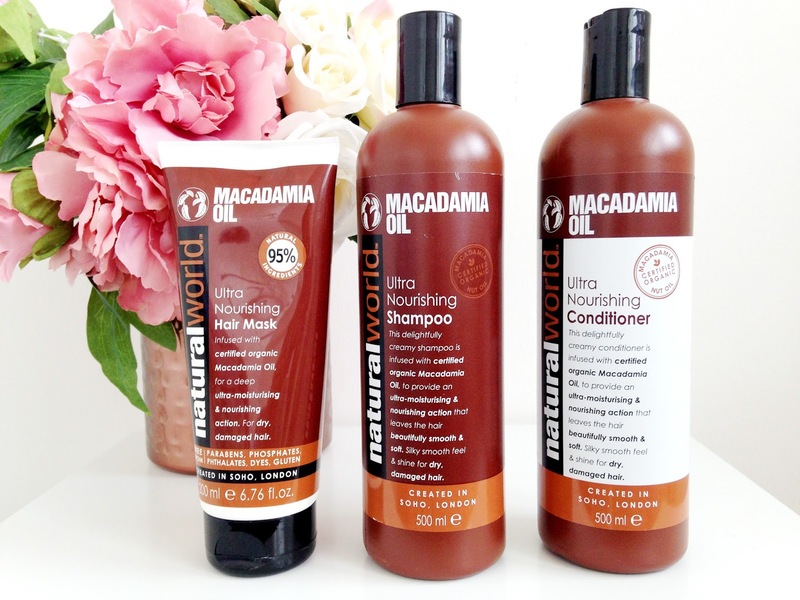 I have been trying out a few products from their Macadamia Oil range, the Ultra Nourishing Hair Mask and the Ultra Nourishing Shampoo and Conditioner. The Macadamia Oil range smells so good, nutty but with a hint of sweetness too, like soft vanilla. The Ultra Nourishing Shampoo and Conditioner is infused with certified macadamia oil and 5 essential oils; cedarwood, lemongrass, rosemary, ylang ylang and orange. They can be purchased in 2 different sizes, 500ml and 1000ml but I have the 500ml bottles. Considering they are 500ml they last quite a while too, well at least two months. Normally I'm out of shampoo and conditioner within 3 weeks but these have served me well so far. The shampoo and conditioner lathers up so well and so that makes them easier to work into the hair. With the conditioner I like to apply it from the mid to the ends of my hair rather than all over as the roots of my hair tend to get too oily too quickly if I apply conditioner to the roots. After using the shampoo and conditioner together my hair feels much more stronger, smoother and ever so beautiful without any unwanted frizziness. They are so dreamy to use. Whenever my hairfeels dehydrated(which happens to be in the A/W) I like to use a hair mask. The Ultra Nourishing Hair Mask is very creamy and quenches my hair with much needed moisture. I like to leave it in for at least ten minutes before rinsing. I find that ten minutes is more than enough time for it to soak into the hair properly. It leaves my hair feeling so silky and nourished with a sprinkle of added shine too which my hair most definitely needs. You can purchase all of these Natural World Macadamia Oil products as a set here for £11.17. I personally think that is quite a bargain. Unfortunately that is at a sales price but the original retail price is £13.97 but what difference does £2 make eh? Have you tried any haircare from Natural World?